This past Saturday hubby and I headed to Hilversum for our weekly lunch date, a tradition we both love and very much look forward to. Well, actually, the whole Saturday is one big date for us because in the evening, we also enjoy a candlelit dinner for two! Couples, we both highly recommend this! 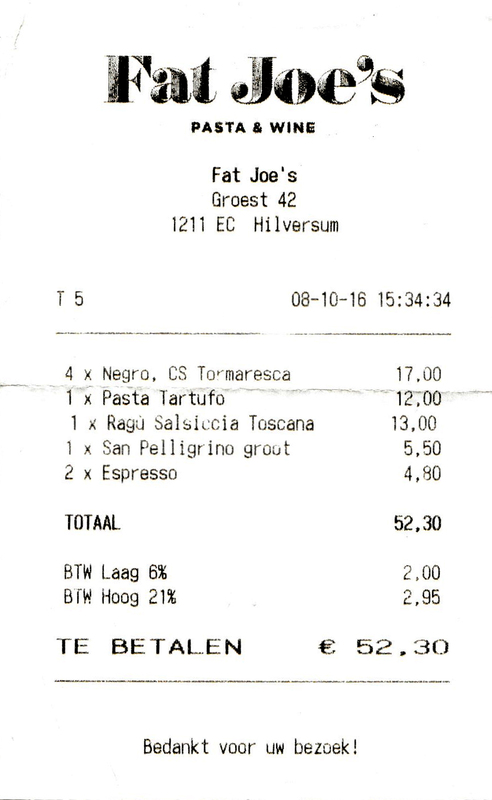 It’s been quite a while since we went to Hilversum, and after this visit, we both decided we should go back a little more often. The market has a few nice stands (including a French food truck where we purchased incredibly delicious smoked garlic sausage) and there is a nice selection of shops and restaurants. This time, we decided on a relatively new pasta and wine restaurant. 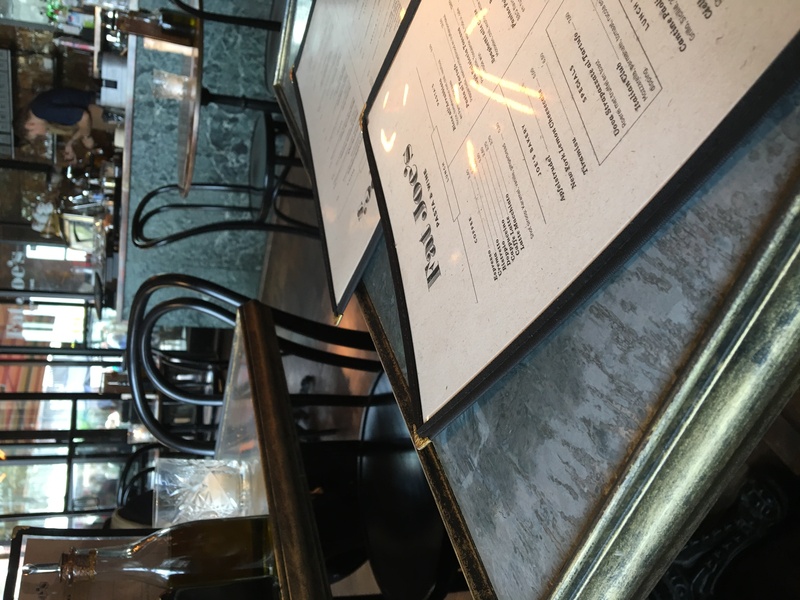 Fat Joe’s opened last fall and is a hip and modern establishment with urban vibes and food and wine at great prices. Located on a lively corner, not far from the market, the restaurant has an inviting (heated) terrace. However, we chose to sit inside, which was a good thing because the decor is something to be enjoyed as well! 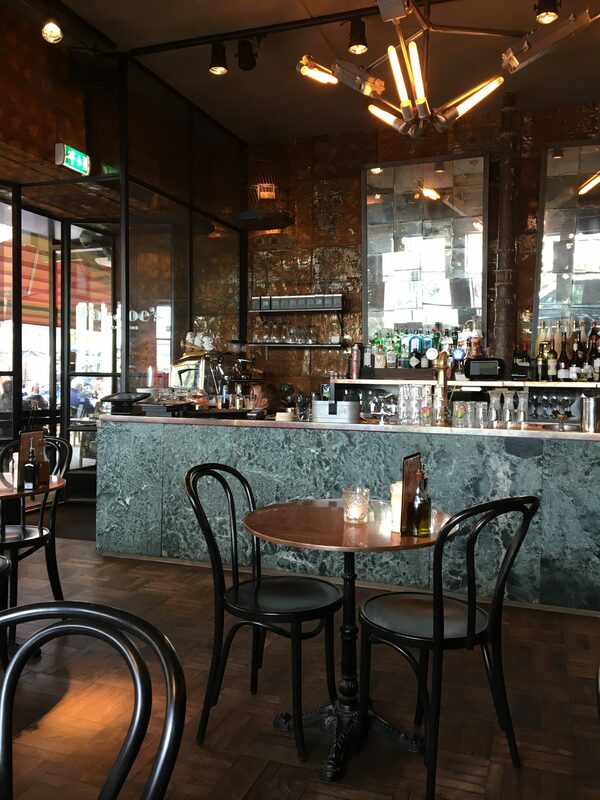 We took a seat not far from the attractive bar, and to my right, I could take a peek straight into the open kitchen. The lunch menu has sandwiches, salads, a small selection of pastas, two specials and three desserts. 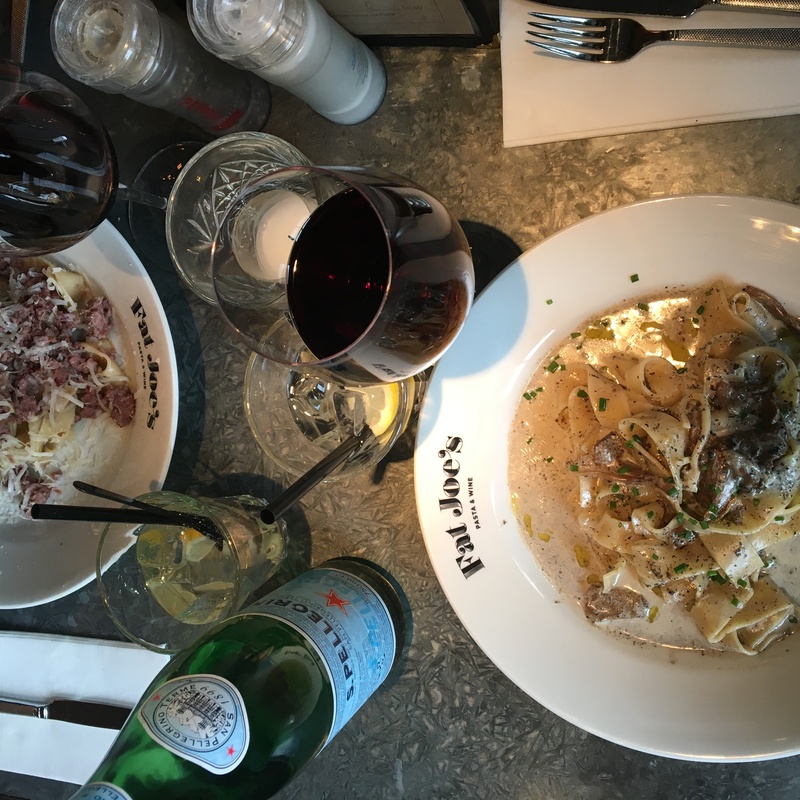 Hubby opted for the pappardelle with sausage, and I had the pappardelle with porcini and truffle cream sauce — absolutely delightful and beautifully presented with a nice drizzle of olive oil. The Puglian Tormaresca Negroamaro-Cabernet Sauvigon, chosen to wash down the meal, was full of red fruit and juicy plums with slightly spicy notes. Gorgeous with my dish. Kudos to the spot-on serving sizes (we left satisfied, not stuffed) and the friendly service. 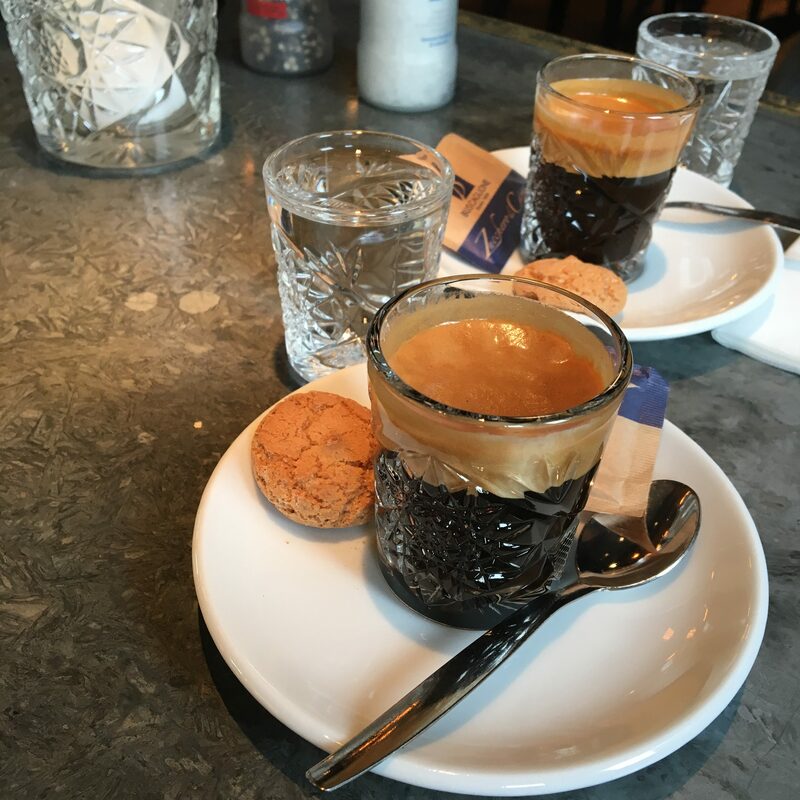 To round off our lunch, we ordered two espressos which arrived perfectly made with a good, thick crema layer. This is definitely a place we’ll return to in the near future. I spotted some very appetizing dishes passing by… like the charcuterie platter and the New York cheesecake! PS: And with a name like that, you’re likely to smile before you’ve even had a chance to stuff a forkful of twirled pasta into your mouth!